We all know that E-mail is one of the most potent tools for Internet marketing. And, thanks to the growth of mobile Web browsing, E-mail marketing is now bigger than ever. …but there’s something we haven’t yet touched on: video. That’s right. The Web has evolved well enough to more fully enable E-mails with videos – and we’re not just talking about 25 GB WMV attachments that take forever to download. There are a number of E-mail marketing-related products out there today that allow you, for example, to embed your YouTube videos so that recipients can watch it from inside the E-mail message. Not only does video E-mail marketing introduce new creative possibilities (no longer will marketers be limited to text and photos); it also enhances the performance of your campaign – as well as the ways in which you monitor that performance. According to GetResponse, a company that provides E-mail marketing and newsletter publishing solutions, E-mails that contain video are more likely to engage readers and subscribers. GetResponse analyzed over 800,000 E-mails and discovered that, on average, video E-mails had 96.38 percent higher click-through rates (CTR) than non-video E-mails. Looking to leverage your Internet savvy and incorporate video into your next E-mail campaign? Here’s a list of important things to consider. Write compelling copy. Sure, video in an E-mail is awesome and all, but it won’t help you market your brand or business any better without a few lines of compelling text. A prominent “Call to Action” near the actual video is a good way to go. Keep it short and simple, though, so as not to draw attention away from the video. Make sure that the offer you make is valuable to your readers, and that they’ll find out more about it once they watch the clip. 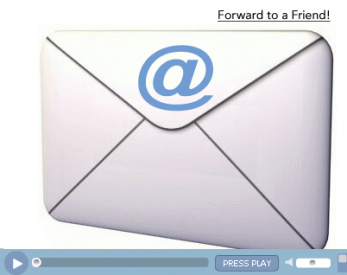 Be careful when creating your video E-mail templates. Regardless of whether you’ve been doing code for years or have no clue what HTML is, there are a few things that you absolutely must take into account. One is that you have to code absolute paths to your images, screenshots, videos, and graphics. Just attaching graphics doesn’t cut it. You need to host these elements of fancy on your server, or on your E-mail marketing provider’s server. If you’re using a clickable screenshot, don’t disguise the link. Just because you now have the power to insert an irresistible Play button doesn’t mean that you should fool your E-mail list. They should be able to click and watch a video, not click and be bombarded by an excessively promotional page. Always have a tracking or monitoring system in place. One of Lakeshore Branding’s favorite E-mail marketing providers, the developer-friendly and easy-to-use MailChimp, offers great performance tracking features, like A/B split testing, subscriber activity reports, and integration with third-party apps like Google Analytics. Whichever system you use, make sure you always track and monitor; that way, you’ll always have the data in place to improve the performance of your campaign.